Feminism has always been something I’ve engaged in practically and passively—like composting or choosing to bike rather than drive. It’s just another thing that seems good for me and my environment; however, I have never considered dumping my compost on my neighbor’s flower beds, or demanding that others give up their cars. 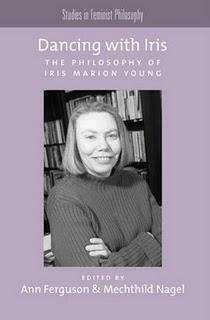 Dancing with Iris, my first official foray into feminist philosophy, makes me feel otherwise. Discarding the pervasive assumption that all feminists are angry and anti-male, Iris Marion Young inspired her peers to collectively revisit her works as a feminist and political philosopher. Through their recounting of intimate discussions with the Chicago-based professor, and their interpretations of her most well-known essays, I have been re-convinced of the important role feminism plays in our society. While great strides have been made for gender equality, we have a long way to go. In the chapter aptly titled “Letter to Iris Young” by Karsten J. Struhl, the author addresses his deceased friend and colleague: “You asked at your last lecture...what is our responsibility against injustice?” This chapter made me ask, what is my responsibility? Is it simply to practice, passively? Or is to encourage and effect even the subtlest of changes in the minds of those who have grown complacent with the minimal incremental progress we’ve been able to eek out of our culture? Throughout that letter alone, dozens of brilliant sparks of feminist thought, which are not bitter nor chauvinist, inspire revelatory ideas I believe we all know and understand, but have never articulated as Young and her peers have done. In my notes on Ferguson’s essay, this one line is underscored much darker than the rest. Beautiful ideas from both humanist and gynocentric thought culminate in an almost annoyingly practical conclusion. Those of us roaming the planet on two legs, feeding ourselves, and making conversation are humans. As such, we deserve from each other a certain level of respect and consideration merely for existing. At the same time, we are still individuals, with different experiences and different thoughts, so we must reflect on these when arguing a position meant to be applied to everyone. Page after page, I felt compelled to underline and make mental notes. So natural seem these philosophies, that their absence in our daily lives can only be because of their obviousness. So with each academic’s philosophizing I—as the reader, the passive activist, the casual observer—become more aware, more fervent, more interested, more committed, and it seems, somehow, more a woman. oh that looks very interesting. i really liked her "On Female Body Experience." it's good to see her work living on.